I had plans of doing some painting today however one thing and another conspired to prevent that from happening. I therefore decided to have a look at the contents of a couple of the kits I had acquired recently – sort of get used to the contents before making them. 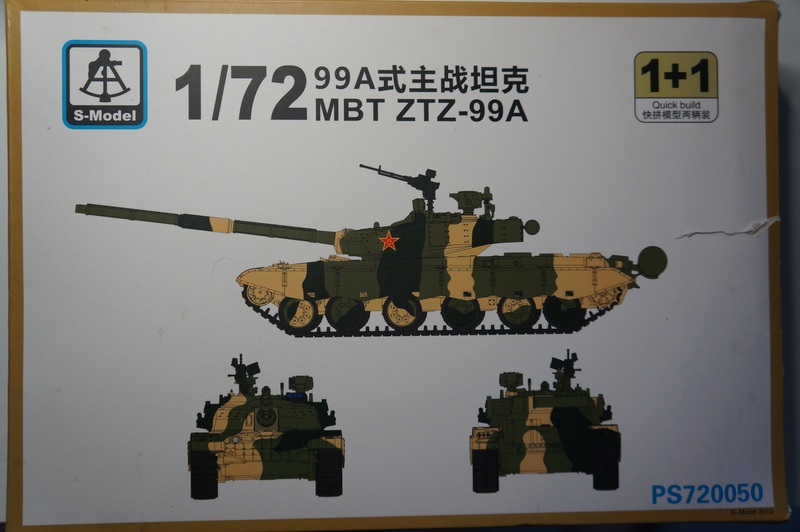 The Type 99 (Chinese: 99式; pinyin: Jiǔjiǔshì) or ZTZ99 is a Chinese third generation main battle tank (MBT). The tank entered People’s Liberation Army Ground Force (PLAGF) service in 2001. I originally thought the S-Model kit was expensive until I realised that the 1+1 on the box meant that there were two vehicles inside the box. From Wikipedia: 99A, the Improved Type 99. Prototype testing was underway by August 2007 and believed to be the standard deployed Type 99 variant in 2011; upgradable from Type 99. The improved main gun may fire an Invar-type ATGM. It mounts 3rd generation (Relikt-type) ERA, and an active protection system. Has a new turret with “arrow shaped” applique armor. The larger turret may have improved armour and a commander’s periscope, and the tank may have an integrated propulsion system. Has a semi-automatic transmission. Once I realised that the number of pieces in the box did not look quite so daunting. Two sprues make up most of the parts. As with tanks, the first question is the tracks. Unlike older kits, the tracks here are moulded to some of the rollers with additional tracks to wrap around the idler and the drive sprocket. 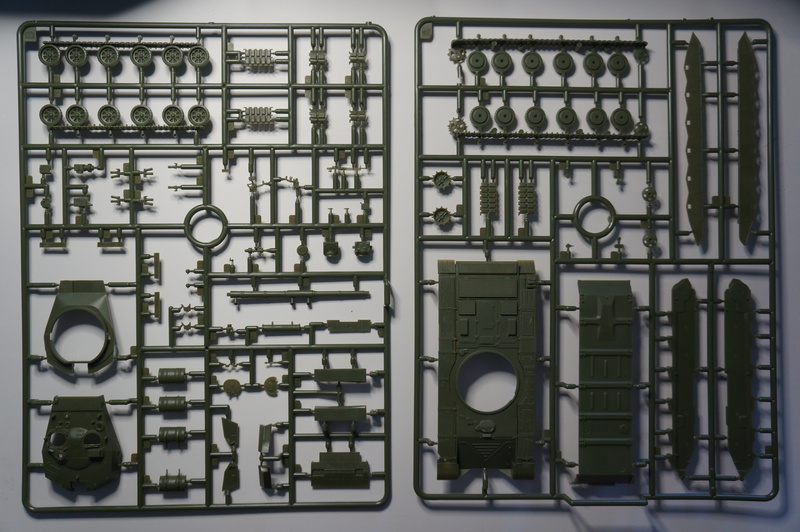 The pieces are crisply moulded and appear as though they will be easy to remove from the sprue. I did not notice any flash with a quick look. 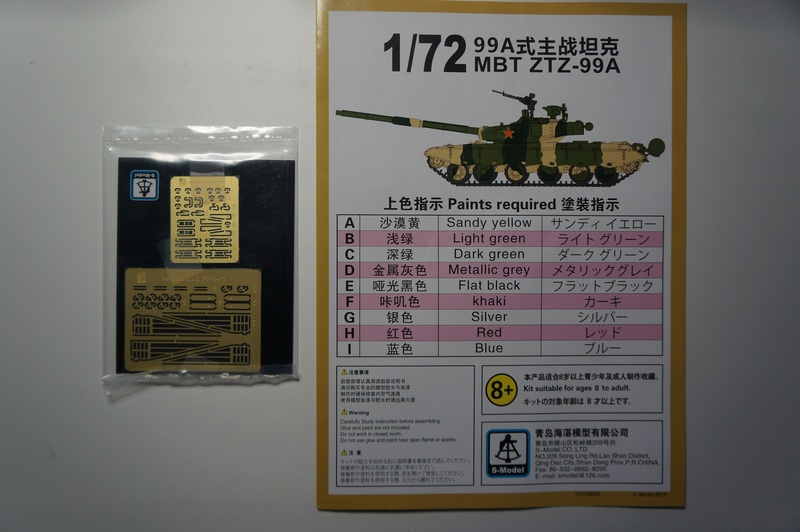 At 1/72 scale this is a large tank, larger I think than the T-64 in my collection and that I will look at later. Perhaps the best part though are the Photo-Etched parts. These are very finely modelled and will add very fine detail to various parts of the tank. Currently the only users of the type 99A are the People’s Republic of China with 4 battalions of Type 99A (124 tanks) in service as of December 2015. I am thinking to start this tank (or one of the other ones I purchased) this week. Overall I like the model and I am looking forward to putting knife and glue to it. I am also wondering what to do with the second vehicle.